Air Powered Air-Con – How Cool is That? Nothing seems more futile in terms of climate conservation than turning on a conventional air conditioning system. It’s too hot so you burn fossil fuels which make the world hotter, possibly forever, in order to make your little box cooler temporarily. It’s like turkeys voting for Christmas. Happily science has made a lot of progress in the technology of solar cooling. There are a number of technologies which are being researched. There are systems which dry the air with desiccants, systems which dry out salt in a vacuum (solar thermal cooling), and there is geothermal cooling. The system we most often favour combines an underfloor system with an air source heat pump to both heat and cool your building. This system is flexible enough to cope with the spring and autumn in Spain, which can be too hot one day and too cold the next. The key to optimising the efficiency of renewable energy technologies is in reducing what you ask of them. In short: stop your building getting hot in the first place and once it is cool, keep it cool. That means good, well thought out, design with careful orientation, window placement, and shading. It means good insulation and, ideally, an air tight building with a mechanical ventilation system and heat exchanger. So you always have clean filtered air in your living spaces at the right temperature and at the right humidity. Add an air source heat pump and you will be cool in summer, warm in winter, and pay back within 5 to 10 years. Under-floor systems are much more efficient. When you heat or cool you deal with the floor, the walls, and the entire structure of the building. Once you have cooled your building, even if you open the door for a little while it stays cool inside. As I said earlier good design, good materials, and good workmanship make a real difference. Once your building is cool it stays cool. 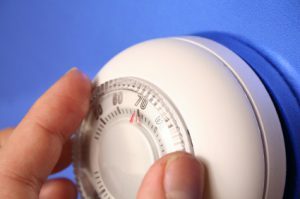 However an under-floor system alone cannot respond quickly enough to sudden temperature changes. That is why our system can also cool the air. Our buildings include a mechanical ventilation system and heat exchanger which massively increases the efficiency of the building. It also allows us to cool (or warm) the air we introduce into the building. This makes the system highly responsive. A system which only heats or cools the air responds rapidly, but is inefficient. If you turn the system off or open the door you soon lose all the cooling or heating effect. Conventional air conditioning systems work entirely in this way and this is why they are so wasteful. In our system the cold water for cooling in summer is produced using an air to water heat pump. This is practical for two reasons. The need for cooling is low because the building has been well designed and built. Secondly, the under-floor cooling means that once cool, it stays cool. The compressor in the heat pump is powered by electricity from the grid. We also install a photovoltaic system that feeds electricity into the grid. Over the course of the year your system contributes more to the grid than is draws from it. So effectively you are using the grid as a storage battery and your system is zero carbon and has zero running costs. A regulator manages the under floor system and the treatment of the air seamlessly. It cools the air to get to the desired temperature quickly then switches to under-floor for greater efficiency. It also manages the danger of condensation because with this system you can also extract moisture from the air. This regulator can even be managed remotely from your mobile phone. By including conventional solar hot water panels you have virtually free hot water in your kitchen and bathroom, and for heating in the winter. Again, this is augmented with the air source heat pump so you always have hot water and heating even on cloudy days. The mechanical ventilation and heat exchanger help keep the heat inside when it’s cold, and keep it out in the summer. That is why we are able to boast that our buildings are cool in summer, warm in winter, and quiet all year round.